Libraries who are members of OCLC catalog records for each of the cultures for eHRAF World Cultures and/or eHRAF Archaeology are available in OCLC WorldCat. Since September 2015, catalog record collections for the two databases are also available to OCLC member libraries through OCLC WorldShare Collection Manager (see links below). Adding these MARC records to your institution’s online catalog will help your students and faculty by providing 1) title and author level access for these (6000+) individual and often hard-to-find resources; 2) subject and classification access for each cultural summary; and 3) keyword access through the titles and summary notes included in these records. To obtain either collection of MARC records and annually updated records, go to the OCLC WorldShare Collection Manager. See https://www.oclc.org/support/services/collection-manager/documentation.en.html or contact OCLC for questions related to OCLC WorldShare Collection Manager. Alternately, your catalogers could download the MARC records individually from OCLC WorldCat. Note: To find the records for the two database sets in OCLC please make sure use the exact titles: eHRAF World Cultures and/or eHRAF Archaeology. Other wording, such as HRAF or Human Relations Area Files will not find them. To receive this group of MARC records and annually updated records, you can subscribe to WorldShare Collection Manager at OCLC. Alternately, your catalogers could download the MARC records individually from WorldShare Collection Manager if your institution already has an account . If your institution has EBSCO Discovery Service and a HRAF membership for eHRAF World Cultures and/or eHRAF Archaeology, you can now get links to eHRAF documents from the Discovery Service. The links take you to the publication information page of a document (see screenshot below). From there, users can view the document and get to all other eHRAF functions: Browse Cultures, Browse Subjects, and Basic and Advanced Search. If your institution is not a member of eHRAF World Cultures or eHRAF Archaeology, you will only have access to the document publication information page. Figure 1. 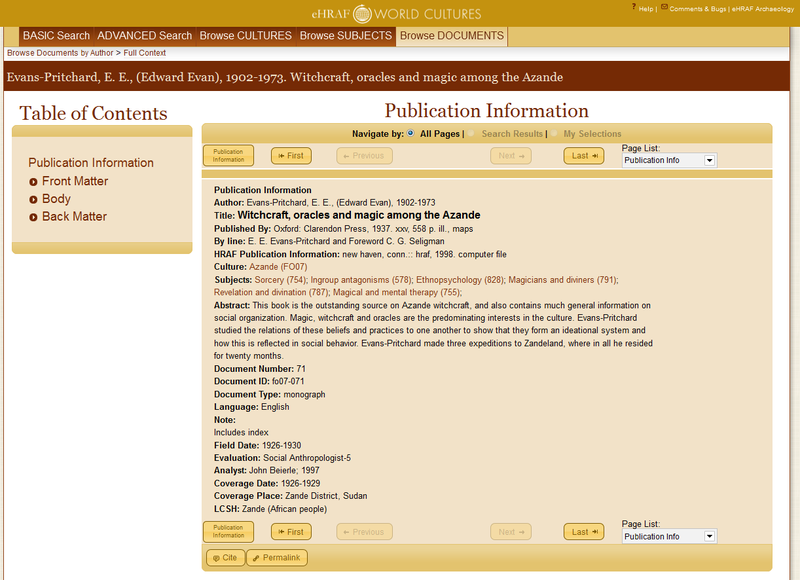 Sample Publication Information page from eHRAF World Cultures as it would appear in EBSCO’s Discovery Service. *EBSCO Discovery Service (EDS) is a core collection of locally-indexed metadata.